When charismatic English teacher John Keating arrives at a strict boys' academy, his unconventional teaching methods breathe new life into the curriculum steeped in tradition. With his wit and wisdom, Keating inspires his students to pursue individual passions and make their lives extaordinary. 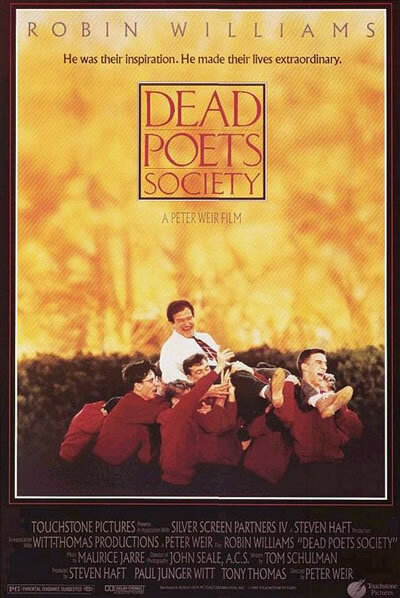 Dead Poets Society screened at the Venice Film Festival and Tokyo International Film Festival in 1989. Why do I stand up here? No. Ding! Thank you for playing. I stand upon my desk to remind myself that we must constantly look at things in a different way. See, the world looks very different from up here. You don't believe me? Come see for yourselves. Come on. Just when you think you know something, you have to look at it in another way. Even though it may seem silly, or wrong, you must try. Now, when you read, don't just consider what the author thinks. Consider what you think. Boys, you must strive to find your own voice. Because the longer you wait to begin, the less likely you are to find it at all. Thoreau said: "Most men lead lives of quiet desperation." Don't be resigned by that. Break out. Now don't just walk off the edge like lemmings! Look around you! Dare to strike out and find new ground. Now, in addition to your essays, I would like you to compose a poem of your own, an original work. Oef! La-ha-ha-ha-hum! That's right. You have to deliver it aloud, in front of the class on Monday. Ooh! Bon chance, gentlemen. Mr. Anderson! Don't think that I don't know that this assignment scares the hell out of you, you mole. A man is not 'very tired'. He's 'exhausted'. And don't use 'very sad', use--Come on, Mr. Overstreet, you twerp. Exactly! Morose! Now, language was developed for one endeavor, and that is--Mr. Anderson. Come on, are you a man or an amoeba? Mr. Perry? No! To woo women. Today we're going to be talking about William Shakespeare. Oh, God. I know, a lot of you look forward to this about as much as you look forward to root canal work. We're gonna talk about Shakespeare as someone who writes something very interesting. Now, many of you have seen Shakespeare done very much like this: "O, Titus, bring your friend hither." But many of you have seen Marlon Brando... you know that Shakespeare can be different. "Friends, Romans, countrymen, lend me your ears." You can also imagine maybe John Wayne as Macbeth going, "Waaall, is this a dagger I see before me?" Dogs, sir? Oh, not just now. I do enjoy a good dog once in a while, sir. You can have yourself a three-course meal from one dog. Start with a canine croquette. Go to your Fido flambe for main course. And for desert a Pekingese parfait. And you can pick your teeth with the little paw. Shooting in and around Middletown took place at St. Andrew's School and the Everett Theatre. Shooting in and around New Castle took place in the Westover Hills neighborhood. RWF Note: There's an extended laserdisc version of this movie available with 10 minutes of extra footage that is not included on the DVD.